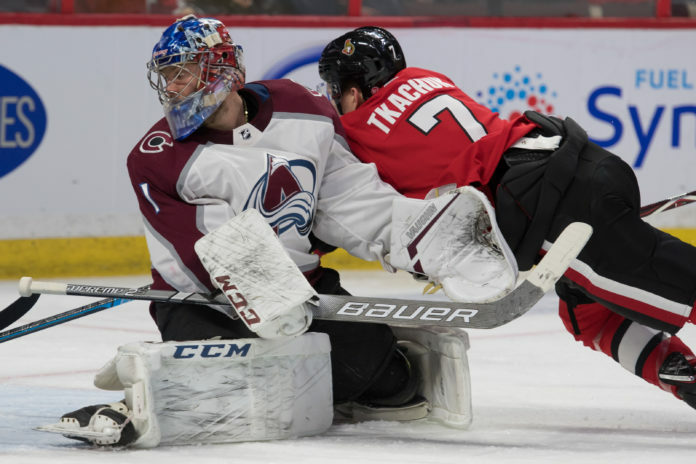 Fresh off a huge victory in Toronto, the Colorado Avalanche looked flat all night against a bottom feeding team on their way to a 5-2 loss to the Senators. The loss capped off the incredibly disappointing five game road trip, which saw the Avs finish with a 1-4 record. While the Avs seem to have found some sort of a second line, their bottom six now looks severely depleted. Alexander Kerfoot’s game has fallen off the face of the earth, and in his last four games he’s a -8. Sven Andrighetto has provided very little offense this year, and Tyson Jost fails to make an impact on a nightly basis. Overall, the Avs have gotten some good production from their secondary scoring compared to other teams, but you can kind of see why Jared Bednar kept Soderberg with the safety blankets for so long to help spread things out. Mark Barberio was very important for the Avs last year as a depth defenseman, but has he played a single good game this year? There’s no way he gets into the lineup next game with how he’s looked and a soon to be healthy Patrik Nemeth. Watching Nikita Zadorov blast the puck past the goalie like he did tonight, one has to wonder how he went his first 81 games in an Avs uniform without registering a goal. He now has 10 goals in his last 96 games and Zadorov might be the Avs’ biggest threat to score from the blueline. Tyson Barrie had the type of game that gets fans to call for his head, despite his production. He was a mess defensively and turned the puck over numerous times. It wouldn’t be an Avs game if we didn’t talk about the goaltending. Semyon Varlamov wasn’t the problem tonight but we’re looking at another game where the Avs got less than stellar goaltending, with him only stopping 86 percent of the shots put his way. 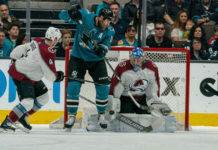 There has been no consistency in net since the Avs record has gone down the drain and it has to effect the players and how they play in front of them. 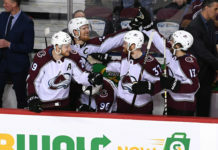 With their fall from grace beginning after November, the Avs have now gone from having a comfortable gap between themselves and the non-playoff teams, to only have a 3-point lead. Time for the team to buckle down. The Avs now head home to take on the Los Angeles Kings on Saturday. The game starts at 1 p.m. MT.